At first, winter sowing might seem like a daunting task, but it really isn't. It does take a little bit of prep work, but the end results are worth it. It's one of the easiest cures I know of if you're suffering from a bad case of cabin fever. My first post about winter sowing -Winter Sowing Ya Gotta Try It! Here's How! - gave a general explanation of how to choose and prepare your containers for winter sowing. My second post - Winter Sowing Part II - was a general summary about seed choices and their growing conditions. Now, let's take a look at what to expect. Pictured above are the first 5 recycled milk containers that I used to do my first winter sowing of the 2014 season. The containers are marked with the date and type of seeds use. The containers are on my back deck nestled in about 4 inches of snow. And there's more snow on the way! I will continue to winter sow throughout the months of February and March at my leisure. Or whenever I am able to tear myself away from drooling over my collection of seed and flower catalogs. Drooling? Did I say drooling? Pavlog's dog comes to mind .... I must stay on track. Sigh. As you can see the containers above are not recycled milk or water jugs, but large plastic flower pots. These are my poppy pots! I prefer to direct sow poppy seeds on the ground or into large flower pots instead of using the standard winter sowing method. I find that poppy seedings don't transplant very well. I usually direct sow my poppy seeds into pots late February. Pictured below is the kind of result I usually get by early summer. 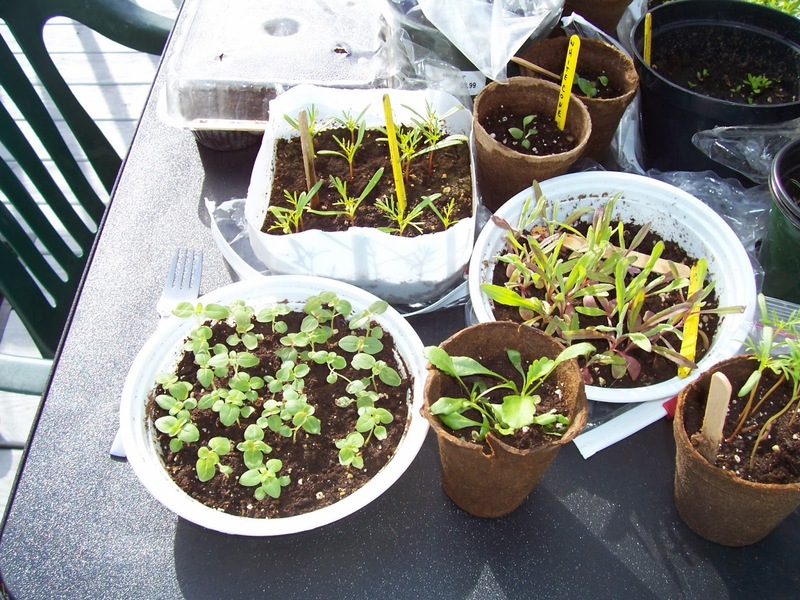 The photo below of my winter sowing efforts was taken a number of years ago and shows a bit of some improvisational winter sowing. Besides water jugs, I had also used some plastic take-out containers, some jiffy peat pots, jiffy pellets, and reused black stock plastic nursery pots. For those containers that came without lids, I had used large gallon sized plastic baggies (with holes punched into them) instead. The plastic baggie covers had sufficed but tended to collapse whenever it rained heavily. Now I prefer to use only recycled plastic water or milk jugs. 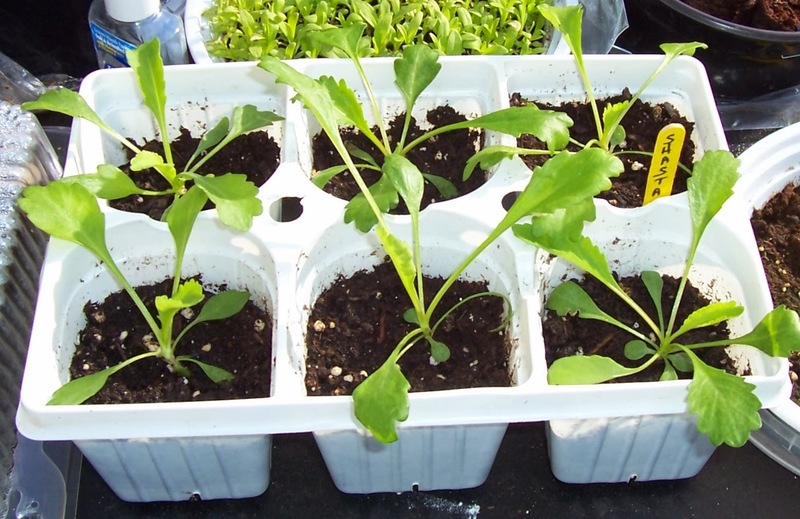 Getting back to the subject of transplanting, sometime in the spring when your tiny little sprouts have transformed into robust seedlings seemingly intent on pushing their covers right off their containers, they will need to be transplanted into your garden beds or flower pots. There are different mindsets on this. One way is to boldly scoop little clumps of seedlings out of your containers and plant them one scoop at time right into your garden. No coddling them. Just scoop them out and stick them in the dirt. The strongest will ultimately survive. Another way is to baby them. You can take a tablespoon or fork and dig into the soil mixture, carefully lift out a small clump of seedlings, then gently separate the seedlings. Taking the healthiest looking seedlings, you would then individually plant them into your garden or flower pots. Viola! I have transplanted my own wintersown seedlings using both of the above methods, but I'm a bit more picky about my winter sown perennials. Since perennials generally are second season bloomers, and their permanent homes will be in a garden bed, I prefer to transplant them this way. First, I choose the strongest, healthiest looking seedlings from a winter sown container. Then, I individually transplant them into a seed starting tray. You can buy seed starting trays and then reuse them every year. I recommend that whatever cellpacks you decide to use be at least 3 inches deep. Then you treat them just like the rest of your other winter sown annuals. Keep them well watered and feed them during the summer. Come late summer, early fall, your winter sown perennials will be more than ready to be transplanted one last time into their permanent places in the garden. This might seem like a lot of extra work, but by giving your seed started perennials more time to grow, your plants will have strong root systems and be much hardier plants in the long run. The following spring and summer they will reward you for all your efforts!